New versions of the Impact Fax Broadcast, Impact Fax Server and Impact ColorFax have been released with improved installation for Windows 7 and various stability improvements. Impact Fax Broadcast v6.72 - Reliable high volume fax broadcasting. Fully scalable up to 384 ports/lines. Impact Fax Server v8.11 - Send / Receive Faxes as PDF or TIFF images in Outlook or through the web interface. Impact ColorFax v8.12 - Simple and effective color faxing software for Windows. Send and receive faxes from the comfort of your home computer. The Black Ice Tiff Viewer Server can be a great tool for Citrix users to scan documents directly to their Citrix server. Black Ice Tiff Viewer's in-built Twain scanner driver allows easy scanning and annotation of documents. Also combining Tiff Viewer with the power of Citrix virtualization will give advantage to Citrix users to scan documents remotely to the server. Black Ice Software's remote desktop printing application, Print2RDP can attach network printers to the session just as your local printer. Print anywhere within your LAN from the terminal server session. Print2RDP allows users to have full access to the local printer driver settings. 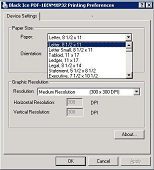 When Print2RDP connects to a printer in the RDP session, on the server side of the Printer preferences dialog only the paper size, orientation, and resolution of the printing can be changed. However by turning on the printer preferences in the Print2RDP Client the users local printer driver dialog will appear just prior to the print job being sent to the printer. This will allow the user to change options such as printer tray settings and other printing options.